2. In large mixer bowl, beat butter, sour cream and sugars to blend thoroughly. Beat in egg. 3. In another bowl, mix flour, baking soda and salt; mix into butter mixture to blend thoroughly. 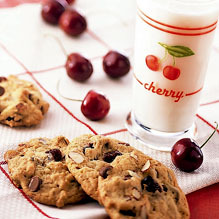 Mix in the cherries, chocolate chips and almonds to distribute evenly. 4. Drop tablespoons of dough, spaced 2 inches apart, onto greased baking sheets. 6. Cool on pans 10 minutes, then remove to racks to cool completely.